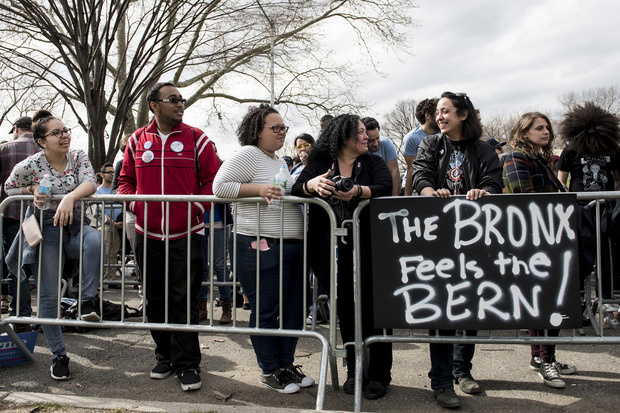 Attendees wait in line prior to a rally for Democratic presidential candidate Sen. Bernie Sanders at St. Mary's Park on March 31, 2016 in the Bronx. Sanders and his Democratic rival, former Secretary of State Hillary Clinton, are campaigning ahead of the April 19 primary in New York. MOTT HAVEN — The Bronx is "feeling the Bern." Thousands of supporters of Vermont Sen. Bernie Sanders packed into St. Mary's Park in the South Bronx on Thursday to welcome the Democratic presidential candidate. The rally, dubbed "A Future to Believe in the South Bronx," kicked off with appearances by actress Rosario Dawson, director Spike Lee and others at 450 St. Ann's Ave.
Sanders, who is trailing Clinton for support among older black voters, used the South Bronx rally to pledge his support to communities of color. In speeches preceding the candidate, Dawson and rapper Residente of the Puerto Rican group Calle 13 blasted former Secretary of State and N.Y. Sen. Hillary Clinton's track record on Latin America, and Sanders followed up with a pledge of support to black and Latino voters. Sanders singled out immigration and the health effects of air pollution, a particularly raw issue in the South Bronx, where asthma rates are among the highest in the country. "This campaign stands with our brothers and sisters in the African-American community," he said. "They are tired of having their kids breathe filthy air and getting asthma." Sanders took the stage around 7:40 p.m., but the activity began hours earlier as people lined up outside St. Mary's Park to get in position. Those who weren't able to get into the rally lined the baseball field just outside the barricades surrounding the park. Before the program began, Morrisania native Alcides Marte said he was thrilled to see the candidate in The Bronx. The Sanders campaign event comes just one day after Clinton spoke at the Apollo Theater in Harlem, where she took aim at Sanders' health care and college funding proposals, saying "numbers don't add up." Sanders lagged behind Clinton in the latest Quinnipiac University poll released Thursday. Ahead of the April 19 New York primary elections, 54 percent of New York Democrats said they would support Clinton compared to the 42 percent who said they support for Sanders. GOP candidate Gov. John Kasich was also campaigning in Queens and Manhattan this week.